The UK’s most popular sudoku magazine wherever it is sold. In a handy, pocket size format The Ultimate Collection’s simple one puzzle per page approach still offers the best value on the market. Great magazine. Good range of difficulty.Small pocket size book,always take it away with me when going on holiday. Have been buying it since it began.Love it. Great little puzzle book. Each edition turns up promptly. I choose this magazine because I like the layout, particularly that there is only 1 problem per page and there are enough in the book to last me a month without there being too many. I really like this sudoku book, it's a handy size & has different grades of difficulty. this is the perfect Sudoku for me, not too hard and not too easy, I particularly enjoy Sudoku X.
I like everything about your publication. The puzzles are at just the right level and I like having one to a page. Your service is also excellent and I would recommend you to anyone. Nice size of book to hold or slip into my handbag.. The puzzles are my level..! there is nothing about this Sudoku that I dislike. It's not too difficult and keeps me occupied in quiet times, especially at this time of the year. 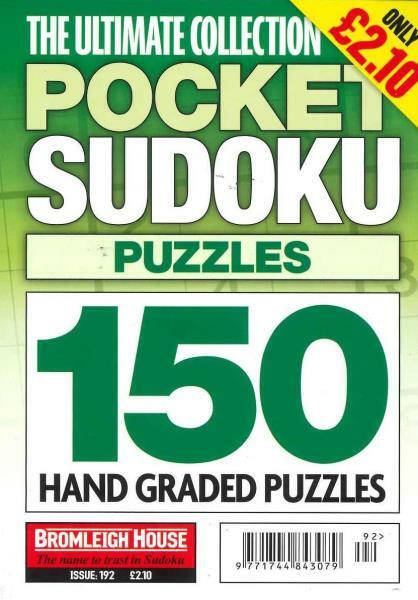 I like this Pocket Sudoku collection because, for one thing, it lists one per page - so it is a decent size! Also because the range is good, 50 at each of level one, two and three difficulty. Each group of 50 finish with a more difficult one that requires diagonals as well as vertical and horizontal completion correct with 1 to 9 range. Number 150 is especially tough! I also like receiving this book in the post as it costs less than the shops and saves searching for it when it may be sold out.